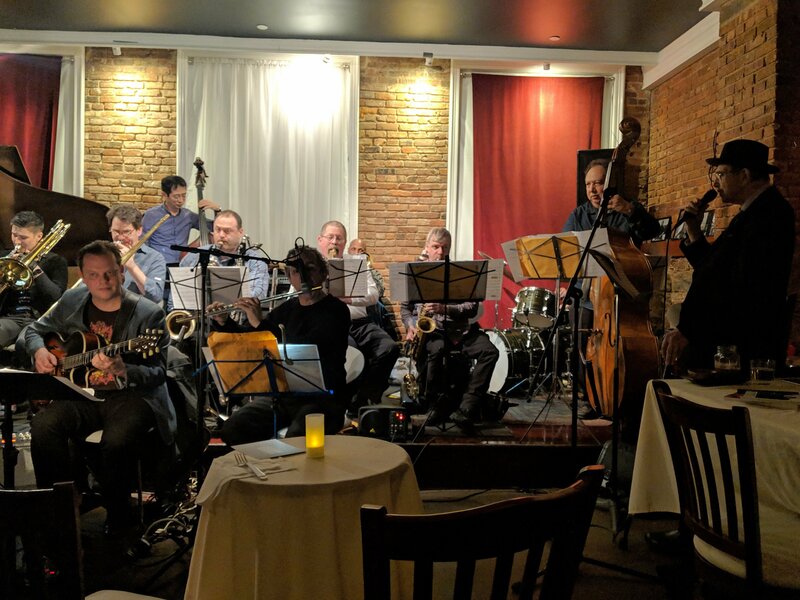 After a two-month hiatus, guitarist-turned-composer/arranger Peter Leitch brings his 14-piece New Life Orchestra back to Club 75 at Bogardus Mansion in New York City's TriBeCa neighborhood. Peter's five nights of successful performances November-January were especially gratifying because they were the first time these arrangements and compositions had been performed by this hand-picked group in public. As Peter Leitch's fans already know, this orchestra is named "New Life" in homage to the artist's near-miraculous recovery from stage 4 lung cancer. Emerging from his treatments unable to use his left arm but full of musical ideas, Peter turned to writing and orchestrating, and now feels freed from the tyranny of the guitar-of daily practice-able to realize his musical ideas in a larger context. Of course, the guitar is featured prominently in his writing-one of the unusual features of this very untraditional big band!